A win for AMD graphics owners is a decent markdown for everyone else. Among the best gaming monitors, you'll notice a ubiquitous trend. Whereas non-gaming monitors emphasize aesthetics over functionality, we the players care more about features that noticeably mitigate the technical hurdles of PC gaming. 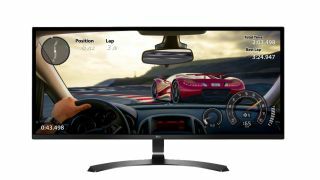 Of these, adaptive synchronization stands out as a must-have, and LG's currently on-sale 34UM59-P display offers just that in the form of FreeSync. At $259.99, the LG 34UM59-P is available for $70 off its $329.99 list price at B&H Photo. Roughly, this amounts to savings of 21 percent. If we're talking specs, this IPS panel pulls its weight and then some. Because it's an ultra-wide screen, it wields a resolution of 2560 x 1080, with an aspect ratio of 21:9. So while it's technically full HD, the added real estate makes up for the middling pixel density. Most impressive is the color range, which spans 99 percent of the entire sRGB spectrum. Otherwise, it's pretty standard fare. Out of the box, the refresh rate is 60Hz, perfect for gaming at an even 60fps. For the aspiring esports legends out there, however, it's overclockable to 75Hz. So even though its 14ms response time is something of a disappointment, you can take solace in the fact that fatalities in Mortal Kombat 11, no matter how poorly executed, will look delicious at a blistering 75fps on this monitor. Seeing as the LG 34UM59-P leverages FreeSync rather than G-Sync, you will need an AMD graphics card to truly relish the benefits of its built-in async functionality. If your rig isn't strictly Radeon, screen tearing can naturally occur, unless you turn on the input lag- and microstutter-inducing vysnc option in all your favorite games. It's a shame it didn't make the list of G-Sync Compatible FreeSync monitors on the market since many of us are clinging to our Pascal cards. That said, should your loyalty lie with AMD or—better yet—you don't give a damn about async technology, LG has made it so you can score a brand-new monitor at a respectable price.